Design, Development, Tooling, Production, Decoration, Pack out, and Shipping all under one roof, SEMCO can tightly manage full retail compliance, and be agile, quick-to-market, and ready for any challenge. Large Tonnage Injected Molded parts can be done easily here at SEMCO Plastics with the emphasis on transforming metal components through our design engineering department. These parts have a cost advantage when comparing to assembled metal components, painting or finishing. Insert Molded parts involve molding in fasteners, handles and or metal components directly into the part during the molding process. SEMCO uses 6 axis robotic automation to precisely load inserts into the mold. The results are a strong bond between the finished part and the metal component eliminating an unnecessary secondary process. Gas Assist Injection Molded Parts provide an advantage when molding thicker parts. G A Parts will produce smooth outer finishes with no sink marks, become lighter in weight, improve dimensional stability, along with reducing cycle times, and material costs. 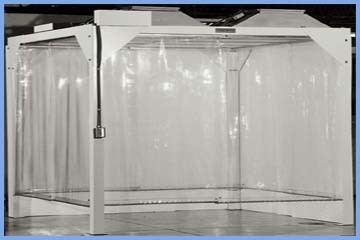 SEMCO’s Custom Clean Room Molding utilizes state-of-the-art HEPA air filter system with positive air flow to ensure ISO Class 8 Class 100,000 Clean Room Standards.